Walter Fernando Pérez (born January 31, 1975 in San Justo) is an Olympic gold medal-winning racing cyclist from Argentina. 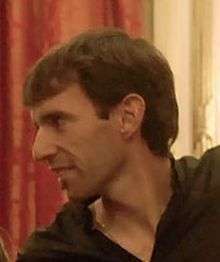 Pérez, who joined the Argentine cycling team in 1992, won the Cycling World Championships in 2004 and Men's Madison gold medal at the 2008 Summer Olympics with team-mate Juan Curuchet. Walter also won two gold medals at the Pan American Games (2003 in Santo Domingo and 2007 in Rio de Janeiro). Walter carried the flag for his country at the opening ceremony of the 2011 Pan American Games in Guadalajara, México and 2015 Pan American Games in Toronto, Canada. In 2008, he received the Gold Olimpia Award as the best athlete of the year from his country with Juan Curuchet.